The Northern Cape might be South Africa’s most scarcely- populated province but that’s why I love it. The barren landscape is broken by dolerite-capped koppies and mini dust tornadoes that careen across the dry shrubs. This region is also home to the Karoo and Karoo lamb, who munch on the Wild Lavender or kapokbos, native to the region, giving amazing plumpness and its own deliciously distinct taste. It was time to stock up the freezer. But before the thought of sumptuously succulent braaied lamb chops took over my brain, I gleefully rubbed my hands at the opportunity to stretch the legs of my December test car: Volkswagen’s Arteon. 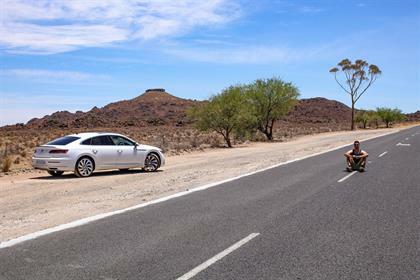 The five- and three-quarter hour trip seemed like a perfect test for the svelte four-seater saloon car. Mercifully I had the two-litre turbodiesel powered model and thankfully it was fitted with the gorgeous R-Line kit. The Arteon is Wolfburg’s global flagship sedan and arguably the best-looking car penned by VW’s designers. The four-door fastback has a gorgeous deep grille decked out in black to create an imposing front end. It’s roomier and comfier than an SAA business class seat but unfortunately only has space for two rear passengers. Fortunately, only my parentals joined me on this jaunt up the N7. So, we rose early and bundled the padkos into the car, making space for a cooler box that would return filled to the brim with a ribs, loin and chops. The Arteon didn’t break into a sweat in gobbling up all our sundries. Being the flagship sedan in the range, the Arteon is fitted with a few systems that made the long trip go by a lot faster. The adaptive cruise control uses a radar to ‘latch onto’ the back of the car in front without having to touch the throttle or brake pedal. There is also a heads-up display which has the speedometer in the driver’s line of sight, VW’s system uses a piece of plastic that rises from the dashboard ahead of the driver instead of being displayed directly onto the windscreen. And while the driver’s chair can be electrically-manipulated in every way to obtain the perfect position, the trick up its sleeve is the massage function (driver only). It’s not super sophisticated and lasts for around seven or eight minutes before a prod of the button on the right-hand side of the pew gets it working again. 130Kw and 350Nm doesn’t jump off the page, especially when hauling a 1.6-ton car. Having said that, it didn’t struggle to keep up with traffic, mainly because it starts torqueing at 1600r/min. I hardly used the shift paddles too often but when I did the gears changed down quickly enough. The seven-speed DSG can’t deal with the amount of torque and that’s why the 6-speed does duty in the Arteon. Sticking to the speed limit I managed to get the average fuel consumption down to 5.3/100km, impressive considering the highs of 38 degrees I encountered on the trip. The other engine option for the Arteon is a detuned version plucked like a hair from the Golf R. Albeit in the Arteon it only makes 206Kw and 350Nm. It also has a weight penalty because of its four-wheel drive system. And having spoken to other journalists who’ve driven the petrol version, the chassis can deal with more power. And the ‘executive with a ripped body’ styling hints at something more powerful too, I guess. With the meat (a full lamb) packed into the cooler boxes, it was back on the road. Driving back to Cape Town gave me time to reflect on the Arteon and its purpose in the line-up. The styling is on point, it looks like nothing else on the road and if I was in the market for a sleek sedan then the Arteon would be a contender having lived with it for a while. It's dependable. Having the Arteon for a month was a good litmus test. Did it pass? Yes, with flying colours.